Le Chapiteau was filled to capacity and the sun was shining brightly on Sunday morning when Kent Nagano gave the downbeat for Brahms’ Symphony No. 1. Two hours later, after the closing chords of Strauss’ Der Rosenkavalier, it was clear that the Knowlton Festival had ended twelve days of fine music-making in triumph. Several hundred audience members stayed after the concert to enjoy an excellent buffet lunch served in the Chapiteau lobby. From the comments I overheard, the combination of beautiful music, good weather and tasty food had made believers of nearly everyone. In this final concert of the Knowlton Festival 2009, Kent Nagano and the OSM concluded their Brahms cycle with the magnificent Symphony No. 1. Today's performance was of a piece with those which had preceded it. Nagano likes his Brahms lyrical and transparent. In all his readings, one notices a wealth of detail often passed over by other conductors. That said, to my mind, Nagano’s approach to the first movement of this particular symphony was a little sleepy. The second movement began extremely slowly and I wondered whether it could be sustained. It was! The OSM strings adjusted their bowing and, in the case of the solo wind players, dug deep for extra breath to carry them through the long lines. The horn and violin solos were exquisite. The last movement is really the heart of this masterpiece and Nagano shaped it beautifully. The whisper-soft pizzicati were perfectly coordinated. Scarcely a sound was heard from the wholly attentive audience. The performance ended in a blaze of sound with particularly vigorous contributions from the OSM timpanist. Every festival concert this season featured vocal music. On this occasion, we heard soprano June Anderson in Beethoven’s Ah! Perfido Op. 65, and in the "Marschallin’s Monologue" from Act I of Der Rosenkavalier by Richard Strauss. To cap the evening, Anderson was joined by soprano Sumi Jo and mezzo-soprano Susan Platts for the final scene from the same opera. Anderson and Sumi Jo are seasoned veterans, and Canadian Susan Platts held her own in this distinguished company. Nagano accompanied the artists with characteristic sensitivity, giving the audience music-making on a consistently high level. I had the privilege and the pleasure of attending nearly every concert in this year’s festival. It became obvious to me early on that much of the success of the Knowlton Festival depends on the artistic vision and energy of one man - Kent Nagano. My own rough analysis suggests to me that, during the twelve days of the festival, Nagano must have commuted from Knowlton to Montreal and back at least a dozen times. Conducting seven concerts, Nagano must have been involved in at least twenty rehearsals of one kind or another, and yet, at each festival performance, he appeared fresh, involved and in total command. And let’s not forget that just days before the Knowlton Festival began, Nagano flew into Montreal from Germany, after an arduous series of opera performances – with very different repertoire - in Munich. And right after the Knowlton festival, he heads to Italy for performances of Don Giovanni with Canada’s Tafelmusik Baroque Orchestra. There’s more than energy and artistic breadth to admire about Nagano. From a musician’s perspective, his technique is exceptional. You may notice that while many conductors keep both arms in motion doing pretty much the same thing, most of Nagano’s conducting is done with his right hand. You may also notice that the right hand moves in very carefully circumscribed motions. Most musicians prefer a conductor who is not flailing his arms all over the place, one whose gestures are clear and precise. In this respect Nagano is the ideal conductor. He gives the musicians what they need to give the best of themselves. In addition, he is - in his quiet and diplomatic way - absolutely insistent on getting what he wants. Musicians don’t mind being pushed and disciplined to a certain extent, as long as the person doing the pushing is well-informed and confines his pushing to musical matters. Again, this is an accurate description of Nagano. Knowlton Festival Here to Stay? The Knowlton Festival was launched last year by Kent Nagano and local businessman Marco Genoni to celebrate the glories of bel canto. Nearly all the concerts were given on successive weekends. This year, the repertoire was broadened and many more concerts were added to give music-lovers something to enjoy every night of the almost two-week long festival. Perhaps the expansion was a little too ambitious - the weeknight concerts drew smaller audiences; on the other hand, the festival certainly maintained a presence in the community it didn’t have last year. 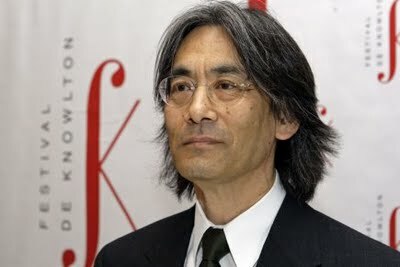 Maestro Kent Nagano is clearly the heart and soul of the Knowlton Festival; what will happen if he decides to leave the OSM? Would he continue his affiliation with Knowlton? Remember that the Lanaudière Festival lost Nagano and the OSM to Knowlton because Nagano is committed to being in Munich in July. How tempted will Nagano be to take on opportunities that will limit his appearances with the Knowlton Festival in the coming years? And how long can anyone operate a summer festival featuring a major symphony orchestra in a small hall seating 850? I can’t think of any festivals anywhere in the world that can pull this off. Most successful festivals utilizing a small hall engage a student or training orchestra. A full-sized professional orchestra typically increases festival operating costs, to the point where halls seating thousands are required to balance the budget. Of course private donations and government grants are always required to make up the difference, but the fundraising challenge the Knowlton Festival has given itself appears almost insurmountable. Hopefully, festival organizers are already busy developing a sustainable long-term concept. Festival Programming Too Many Missed! On the penultimate day of the festival I heard some fine singing by soprano Marianne Lambert and tenor Juan Noval-Moro. Unfortunately, only about 50 people attended this ticketed concert at Chapelle St-Édouard. I also took in part of an excellent - and well attended - master class by conductor and coach Massimiliano Muralli in West Brome. Muralli walked some young singers through excerpts from Mozart’s Don Giovanni and the expertise he shared with them (and the audience) was invaluable. He emphasized the importance of language in opera – accenting Italian correctly and really understanding the meaning of the words; the need for singers to respond to the harmony in the music and to what the orchestra is “saying”; and the importance of controlling volume to produce a more beautiful sound. Finally, I had the pleasure of seeing a wonderful children’s opera called Orfea and the Golden Harp. This was a Jeunesses Musicales Canada presentation featuring a Toronto-based group called Theatre Cotton Robes. The two performers smoothly alternated French and English and their singing and costume changes kept the children in the audience enthralled. Much of the music was taken from well-known operas. This was a fine introduction to opera and should have been seen by more people. Again, there were fewer than fifty people in the church. Perhaps a greater effort could have been made encourage parents and children in the area to attend. It would be wise, both in terms of music education and audience development, to invite this nifty little troupe back to the festival again next year. But next time make sure that local schools are alerted! Who knows? Perhaps the local school board would even consider sharing some of the cost!